Story of my life..... MIA from blogging once again. I've taken on a few more responsibilities over the past few weeks and life has gotten in the way again. 2. Cut out sugar--- will begin decreasing and limiting sugar...not even close!! Now onto the fun stuff!!!! Crazy compression offered me a pair of socks to review and giveaway!! I picked the OTC purple future dots as I am definitely on a purple kick. Here's some product and company info. I wear compression socks for all runs over 10 miles and for recovery. I have always been a firm believer in compression wear as I have worked in rehabilitation long enough to see the benefits that my patients get from them. They offer good compression, do not wear out (I've worn them the last three long runs) and are not easily snagged. I will be buying more from them in the future as the designs that are offered are AWESOME!!! Now for the even better stuff.... I'm giving one of you lovely readers a pair. I have only tried CEP and Eurosox, but I'm such a compression fan that I'd love to try more! I love my CEP. They are good but a little pricey!! Anything Purple is where it's at! By the way I put in white vermond cheddar and turkey into those zucchini boats! They looked so delish. I will have to try that!! I normally only wear the compression socks made by Feetures! but I am willing to try something new, especially the flashy colors! As far as which one? I have not idea.. they have so many cool designs to choose from! 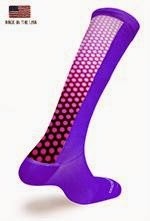 I love the Black OTC Future Dots socks - so cute!! I love the future dots too. There are so many others to choose from! I've never heard of Crazy Compression but they look really great! I found them through a fellow blogger. I love them!! I have one pair of cep compression socks. I like the Black OTC Dots! I need to get another black pair! The flower power ones are very cool!! I love the black with the lines of dots! I know and they aren't that pricey so I've got a few! I love the Black Sleeve Groovy! I should try the sleeves, I've got a Pro pair that I've used once! The smoke ones and really nice! I would pick Purple OTC Wall Flower, they're so cute! I wear CEP for recovery and Pro Compression for running. I'd love to try a new brand. I'd choose the Black OTC Dots. I love my CEP, they are just expensive!! I use CEP but they are expensive. I usually wear pro compression but I'd love to try these! I'd say they are at the same level of Pro Compression. It's so hard to choose - so many pretty ones! The Pink OTC Calf Smoke caught my eye. I've only tried CEP calf sleeves and love them. :) Thanks for the giveaway! CEP is my all time favorite, they are just pricey and boring!! Crazy Compression are my favorite socks by far! I love their custom designs but I also love their Black OTC Diamonds! I think the designs are great!! I will probably buy a ton more from them as the compression is great too!